The major story today is of capacity building in communities south of Baghdad. Key criminals continue to be captured, along with huge weapons caches. Great progress in Kirkuk, where IP are taking over from IA. Celebrating an Iraqi hero, who says that the real heroes are the American Soldiers. BAGHDAD – Iraqi SF detained 2 key suspects April 13 and April 14 in Seddah and turned them over to CF in Mussayib. The key suspects are believed to be responsible for multiple attacks on CF and IP during the first week of April to include an IED attack on the IPs April 3, transporting weapons and explosives and burning a Badr Corps building April 1. The joint effort between the Seddah IPs and Soldiers with 2nd Plt, Co C, 3rd Bn, 7th Inf Regt, 4th BCT, 3rd ID, was directed specifically to capture the battalion-level key suspects. The battalion has captured 30 key suspects, with 11 of those being at the brigade-level, since taking over operational control of the area in December. Additionally, more than 200 citizens held a demonstration in Seddah April 14, to further enforce their rejection of criminals and their support for Iraqi SF and Coalition efforts, said Fournier. CAMP VICTORY – MND-Center began the main phase of its first major op devoted primarily to capacity building in communities south of Baghdad, April 15. Op Marne Piledriver is an op to expand governance, economics and infrastructure taking place in the area of ops of 3rd BCT, 101st Abn Div (Air Assault). While the focus of the op is on capacity building, Iraqi SF will simultaneously target remaining insurgent pockets with the help of CF. “Marne Piledriver will not only showcase Iraqi SF-led ops, but also the establishment of a JSS at Yusifiyah, the development of Iraqi-run radio stations, the injection of funding by the GoI to refurbish 2 major water treatment plants and the infusion of funds and expertise into the poultry and agricultural industries,” said Col. Dominic J. Caraccilo, cmdr. of 3rd BCT. Providing training to GoI officials in the area is another key component of the operation. The U.S. Agency for International Development is providing training on free-market economics. Another major project is the revitalization of the poultry industry. Poultry farms in the area will receive 35,000 eggs, and the chickens will be raised and processed for consumption. It is estimated that poultry industry revitalization alone will create 1,000 jobs. KIRKUK – Responsibility for the traffic control point in Kirkuk was handed over from the IA to the IP in a ceremony at the Irbil TCP, April 14. The ceremony signified the official transition for overall Kirkuk security to the police, and marks a critical shift from Marshal Law to the Rule of Law enforced by the local law enforcement authorities. TIKRIT – The Iraqi Department of Border Enforcement discovered a cache of anti-tank mines after taking small arms fire from an unknown number of terrorists, April 14. The DBE soldiers returned fire in self-defense, driving the terrorists toward the Iranian border. More than 160 anti-tank mines were found after the terrorists broke contact. 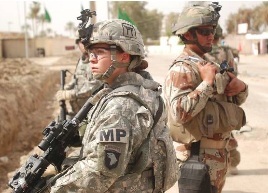 The Iraqi DBE in northern Iraq includes more than 8,700 agents and covers 9 points of entry. The DBE in northern Iraq is part of the overall 150,000-person Iraqi SF. 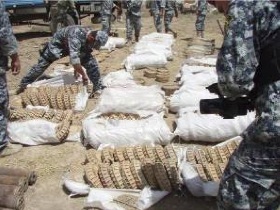 BAGHDAD – April 12, while patrolling the streets of the Rashid district in southern Baghdad, Soldiers from Troop C, 7th Sqdrn, 10th Cav Regt, 1st BCT, 4th ID unearthed 5 rounds of unexploded ordnance during the continued effort to provide security and stability to the 1.2 million Iraqi citizens who reside in the district. 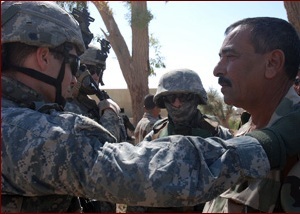 The 1st BCT, 4th ID, continues to conduct daily combat patrols with Iraqi SF to minimize violence, and the “Raider” Bde remains committed to providing a safe and secure environment for the Iraqi nation and the Iraqi people as a whole. An IP unloads a 107 mm rocket from a truck seized southeast of Baghdad, April 13. The NPs seized the cache southeast of Baghdad after receiving a tip from a local citizen. More than 540 anti-tank mines, 29 120 mm mortars, 7 107 mm rockets and 5 RPGs were hidden on the truck under piles of hay. IP inventory anti-tank mines seized. Capt. Quinn Eddy, cmdr, Bravo Co, 1st Bn, 87th Inf Regt, 1st Bde, 10th Mtn Div thanks Khalaf Ali, a SoI leader in Hawijah, for his efforts and those of his men during a recent visit. HAWIJAH — Ali had just finished checking up on his fellow SoIs around the city. It was April 2. The day was turning out to be another hot one in Hawijah, located approx. 60 miles south of Kirkuk City in the Kirkuk province. He had just sat down to cool-off with an ice cream when a young man he did not recognize approached. In a blink-of-an-eye, Ali would be wrestling with a suicide bomber bent on killing him. Ali noticed how nervous this person appeared, sweat visible on his face and clothing, and how one half of his body did not appear normal…”much larger and bumpy,” is how he described it. “I looked into his eyes, and saw fear.” Ali’s gut told him to react to a threat. “I saw his arm moving by his side and his hand was squeezing something.” What Ali saw was the suicide bomber’s failed attempts to trigger an IED strapped to his upper body. It malfunctioned. This opportunity allowed Ali to fire a round from his weapon into the attacker’s chest, and kill him. While his men consider him a hero, Ali considers his coalition brothers the heroes, referring to Soldiers of the 1st Bn, 87th Inf Regt, whose area of op includes the city of Hawijah. “Lt. Col. Vanek and Capt. Eddy are the heroes. Their Soldiers continue to risk their lives to help us establish peace here and are always doing good for our people and assisting in their efforts to rebuild…we owe them so much…they are the true heroes,” he said. 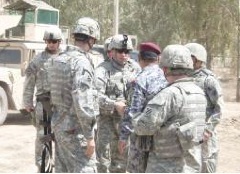 Since Sahwah’s inception in December 2007, overall violence in this Sunni-Arab dominated portion of northeastern Iraq has experienced nearly an 80 percent drop in activity…SoI continue to sign up throughout the Kirkuk Province numbering over 9,000 to-date, according to Maj. Sean Wilson, 1-10th Mtn. Div., public affairs officer.